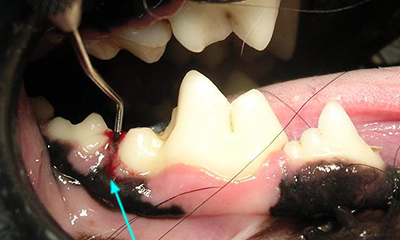 Professional teeth cleaning is an opportunity to perform a thorough examination of your pet’s oral health. Teeth cleaning is only one of the six steps for comprehensive oral evaluation. Teeth cleaning must be performed under general anesthesia. Probing and dental X-rays are needed for every patient (just like you receive). Anything less will miss a dental disease (pockets, infection, fractures) and your pet could “suffer in silence”. 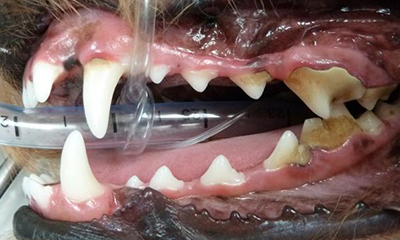 We will share pre, post and procedural photographs illustrating your pet’s oral health status and any treatment performed. Before teeth cleaning and evaluation. After teeth cleaning and polishing. 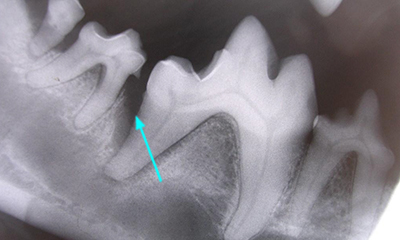 Periodontal pocket revealing bone loss. Dental X-Ray revealing severe bone loss. Our pets cannot talk and rarely exhibit signs of dental pain. Don’t wait till there is a clear (and visible) need for care. Visible signs of dental disease such as gum recession, bone loss, tooth mobility/loss occur late in the disease process. 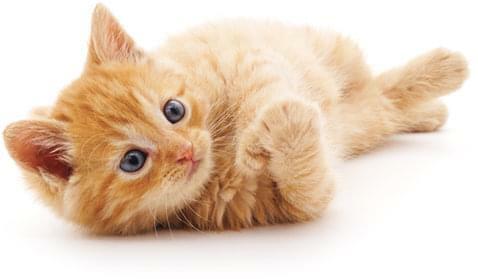 Your pet must be anesthetized in order to perform a thorough evaluation. We will discuss the steps of the procedure and try to overcome any concerns of extended anesthesia, pain, and cost related to findings that require additional treatment. Our goal is to develop the trust necessary to perform any or all needed treatment beyond cleaning/polishing if needed. 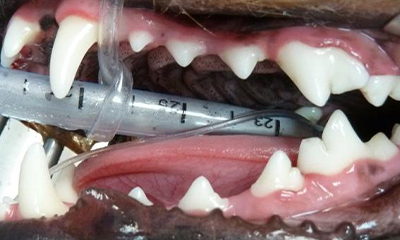 Many veterinary dentists advocate a 10-12 step approach to each dental procedure. We have grouped similar steps and provide a 6-step approach to each dental procedure. Below are the six steps needed to provide comprehensive oral health assessment/treatment plan no matter how nominal the dental disease may appear.